It has been a lot of fun seeing all the workbenches this week. Thanks to all of you who sent pictures. Whenever a non-woodworker visits your shop, they might marvel at — or at least be curious about — some of your tools. Your workbench will probably receive little attention, yet for most woodworkers it’s really the most critical element of a shop. We call it into service on every project we build. If you want to set up a wood shop, your first project must be a workbench. There are plenty of plans available for the “ultimate” woodworking bench, but all you have to do is look through this week’s viewer pictures to understand all that a work bench really needs to be: a sturdy table. This video shows you a workbench design that I’ve been using for years. It costs next to nothing to build: a few 2x4s and a sheet of plywood, yet it will provide you with years and years of quiet service. Plus, with this basic design, you can modify it in any number of ways to suit your particular needs. It’s all held together with a lot of yellow wood glue and 2 1/2″ decks screws. It isn’t a showpiece, but in my mind that’s a plus. You won’t be fearful of abusing it. 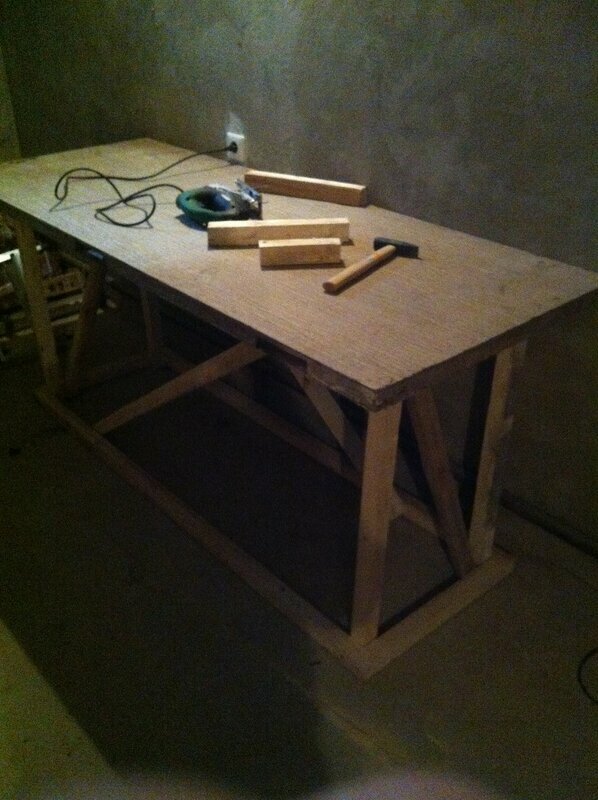 Several years ago, i made two workbenches using a similar design, though without glue… just sheetrock screws. Take one 4x8x 3/4 ply sheet and one 4x8x 1/4 sheet and have the hardware store rip them in half lengthwise. that, plus about 8 or 9 2x4x8′ pieces all fit in the back of my Prius with the passenger seat down. slice and dice as you did to make two 2×4′ tops and similar 2×4 legs all around. i used the 1/4″ ply for sides and backs. my alignment wasn’t great, so some of the drawers’ slides aren’t dead-on, but they work well. i bought a bunch of the Blu-Motion slides at discount from Rockler. i used a bunch of plastic pipes set in at a slight angle for my turning tools after mounting my midi-lathe and two bench grinders to the table. http://www.plusaf.com/_my-workshop/lathe-workbench/P3042141.JPG shows the initial install of the drawer slides and the positioning of the plastic pipes for my turning tools. http://www.plusaf.com/_my-workshop/lathe-workbench/P3252388.JPG shows the bench with the full complement of turning tool holders plus the first two drawers installed. since then, i’ve added two more right under those. your design and assembly techniques are lots better than mine, and i’ll do that if i make some more benches. It is all very well for you guys but some of us have to get by in a workshop 11′ by 9′. If I had a workbench of this sort of size, I’d have no workshop left. Steve, My workshop is an 11×25 basement garage. Larger than some shops, smaller than others. Wish I had the room for an “island” like you have. My first workbench was a 4’x4′ x36 high collapsible table made much the same as the ones you have in your workshop. I got by with it for a long time. It would rack if I didn’t take the time to bolt things together the way they should be. But it could take a beating. I eventually built a more traditional workbench with a tool trough and am very happy with it. It’s made mostly with poplar, but has maple on two sides and a maple clamp body. It’s not pretty, but it looks better than what I had before and, like you said, what’s really important is that it’s sturdy and can take a beating. It also has good storage underneath. Nice video. Basic and informative for us Mere Mortals. my whole worshop is something like 18×24, of which about 1/4 is space available for my lathe, table saw and band saw!… about the size of yours! i know what “cramped for space” means! and the fancy magazines keep showing the 30×50 shops with inlaid floors and skylights, where they spent about as much on three power tools as i spent on my whole shop… and i tell them so, too. the important part is: i can have fun in my postage stamp, and i hope you can, too. may we aspire to “bigger digs” some day. my last “workshop” was smaller than a one car garage. My workshop cost me just £1100 to build and used up every inch of the available space. Alas, in my stupidity, I failed to take into account that willow trees get fatter… One day very soon we will have an interesting decision to make. Is willow any good for anything except cricket bats? In truth, I make components in the shop and assemble them outside. This would be fine if I lived somewhere dryish but here in the rainy Thames Valley I must share the shop with a great big tarpaulin which serves as a tent/roof for those glue-ups which cannot be moved just because the sky has opened. I guess that we all must try to solve the problems set before us. Ha ha ha everyone here complaining about how small their workshops are. I’m a bit pressed for space myself. But along with woodworking I do metal working and electronics in my garage and I have less than 400 sqft of usable floor space in it. I can rip a full sheet by myself on one of my tablesaws with all my doors closed. I attribute all of my success to careful planning. So Mongoose I’m with you when you say, “we all must try to solve the problems set before us”. I’d even go a little further and simply say, we all have to solve our own problems. Like Yoda says, there is no try, do. Once you have the materials ready, you can now begin with the initial step as stated on your chosen workbench designs and plan. Measure your desired height for your workbench. Then, install your metal brackets to the walls studs. You must to place the brackets just underneath the snap line. Drill holes into the brackets for the bolts. You can double check details with the plan on workbench designs. After checking with your plan, sand your workbench and varnish the wood to make it last longer. You can also paint it with any color that you wish for. Learning workbench designs is not really that hard. With a good plan on workbench designs, and a good set of tools, you can easily make your way and build your dream workbench right at your own home. This is a great presentation of how to go about building a great, working bench, and indeed the video stimulates us mere mortals to action to actually be able to build one. One problem I see with the vid though is although it instructs on the construction details of the bench, it does not mention anything about how to get a flat bench surface. As a new woodworker, it’s my understanding that flatness is one of the most important aspects of a useful woodworking bench, because without it, your measurements may turn out inaccurate, as will layout, gluing, and general workmanship will suffer with an uneven bench. I would’ve loved to see some info on how to get your homemade bench flat. I know a level bench is no big deal, but someone correct me if I’m wrong about flatness being critical. And if so,best way to get it flat? I would like to make the large table that is standing in the middle for assembly purposes. Are 4 legs OK with that our do you need 6 of them to support such a large surface. I have built 6 similar size work benches for myself and friends over the yrs. Here’s a couple suggestions: Chose a bench height by standing straight up and bending your elbows at 90 degrees. Don’t build any higher and not much lower than where your forearm would rest. Install the L/ R lower shelf brace on the inside of the front 4×4 posts. You will loose just a slight bit of shelf space but really save your shins. Use extra 2×8 bracing under the top if installing a heavy vise. Check the vise bolt holes first. Hi Steve! I like you way to build a workbench. My next workbench definitely will use this contruction. I would like to build this work bench but I could not download the plans. Could someone please email them to me or tell me where I can get them. Just finish building the first out of 2 worbenches like this one, I need them to be small because of my workshop/garage, and this is perfect. The first one is quite sturdy and really afordable, around 50USD in Mexico with all new materials. Only one comment, the server was down so I made the workbench out of the very good video, hope you can fix the derver issue. Hi Steve I was led to understand that you are able to download and print out plans and dimensions for the BMW WORKBENCH i am new to woodworking and would like these plans is it possible please let me know.